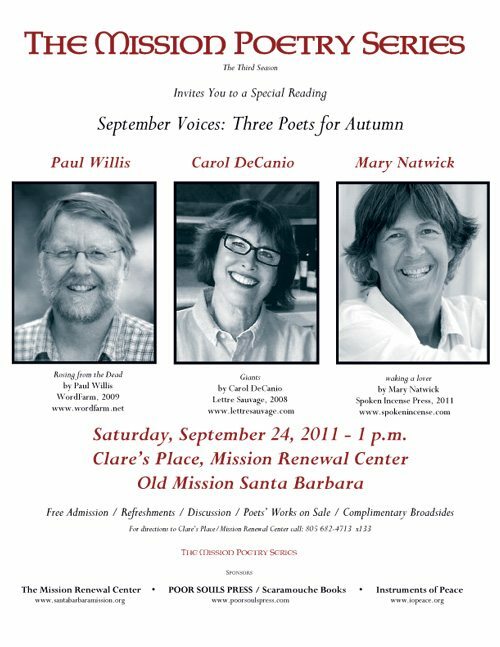 The third season of the Mission Poetry Season in Santa Barbara, California, kicks off on Saturday, September 24, with poets Paul Willis, Carol DeCanio and Mary Natwick. We are grateful to all who have participated in this series from the beginning and to all who have recently discovered us. We are aware that these readings are a success not just because they are well attended, but also because they are supported by those who cannot be there. We are committed to building and nurturing community by offering the gift of poetry to the public in an environment of historic beauty. Thank you, everyone. Best wishes, and we look forward to another great reading. This entry was posted in Carol DeCanio, Mary Natwick, Paul Fericano, Paul Willis and tagged Carol DeCanio, Mary Natwick, Paul Fericano, Paul Willis, Poetry, The Mission Poetry Series by Monsieur K.. Bookmark the permalink.